We’ll be at Critchill Manor Estate, two miles from Frome, Somerset, from Tuesday 30 July – Sunday 4 August. Check out the photo gallery from 2018, and please have a look at the festival programme page for an outline of how we make NVC the fabric of our event! 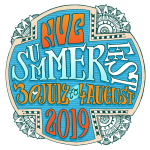 Elsewhere, meet the Summerfest team, find out what’s on, discover more about the venue, read up on coming with children, get the lowdown on the Summerfest Fees, consider volunteering, get travel directions, and read our Ts&Cs. Ready to book? Fill in the online booking form. Critchill offers 186 acres of park and woodland. Its tucked away among the rolling Somerset hills and surrounded by lush, peaceful countryside. Once the Frome Golf Club it can be found on the outskirts of this vibrant and funky town and has now been transformed into a picturesque and versatile event site. There’s a lovely walk along a footpath to Nunney Castle, and Frome railway station is only 2 miles away. Address: Critchill Manor Estate, Critchill, Somerset, BA11 4LJ. See directions and travel help.